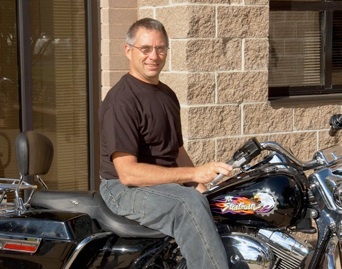 Following in his father’s footsteps, Carl was a motorcycle enthusiast from the beginning. By the early age of 10 Carl was competing in mini-bike races. On his 16th birthday he received his AMA professional competition license. A year later, as a junior, Carl competed against his dad, Ron Stratman, on the short track at Tri-City Speedway in Granite City, IL. Carl has been part of RK Stratman since its start. While still in high school, he and Larry, his sister Vicki’s husband, printed decals in the garage of the Stratman home. He served an apprenticeship as a plasterer, and then returned to the company as a t-shirt printer and supervisor. From there he continued to learn about the process of printing and how to refine it. Today, Carl is the President of RK Stratman and works closely with his sisters as they operate the business together. Carl and his wife, Laura, have been married since 1979 and have two daughters, Heather and Jessica. Both Laura and Heather work for RK Stratman in the Human Resources Department. When they aren’t working, Carl and Laura enjoy spending time with their four grandchildren.